The day the first Belgian Mirage crashed. Why somebody remembers a day at the end of the month of March, several years ago? Most probably, something important or very specific happened that day and the event stays engraved in the memory of the concerned individual. In any way 28 March 1972 was for me a day to remember. These days I was a young military pilot at the 2nd squadron at Florennes. Since the introduction of the brand new Mirage in the inventory of the Belgian Air Force for about 18 months, we were the first pilots who had to demonstrate for NATO, during a demanding Tactical Evaluation or TACEVAL, that we were really combat ready to do our job. Our colleagues at the 42nd squadron would have to demonstrate their capabilities in the reconnaissance role. In the early seventies we were equipped and trained as a fighter bomber squadron to contribute to the deterrence of the full raging Cold War. On Tuesday 28 March 1972, the second day of the TACEVAL, everything seemed to be normal. At 7 o’clock in the morning everybody was prepared for the finishing touch of the evaluation. We were all ready after the interruption of the night to plan a new mission. A standard briefing in our cosy bunker informed us that all airfield facilities were working properly. The meteorological forecast indicated that we might expect only a few showers of light rain or snow. We were all fully confident that we would get a day of good flying weather. The intelligence officer gave us an update on the situation on the battlefield. Our operations officer or OPS remembered us the key actions to take in the case of enemy action with particular attention for a threat of ballistic missiles or the outbreak of a nuclear war. In both cases the aircraft should take off in the shortest possible time in order to survive by staying as long as possible in the air. In the mean time, several NATO evaluators observed us attentively, interrogated us about general operational knowledge and took some notes from time to time. In fact we were all interested to get airborne as soon as possible because particularly in the air, we could demonstrate our capabilities. Luckily for us, soon an impressive list of missions piled up on the OPS-desk. After having taken all priorities into account, all 18 available Mirages filled the planning board with a mission number, a time over target and a pilots name. We were tasked with 4 Mirages to attack a Surface to Air Missile or SAM site, about 30 kilometres behind the Iron Curtain. We had 90 minutes available to prepare the real mission with maps, intelligence update and with briefing of the target-bound portion of the mission, the attack itself and the homebound leg with recovery and landing. Of course we would not fly this task but we would execute an equivalent mission, comparable to the real one. Also this equivalent task, a site of a German NIKE SAM unit, located in south-east Germany about 60 kilometres south-east of the city of Heilbronn, had to be prepared and briefed. These equivalent missions were ready available in a handy Combat Mission Folder or CMF. This booklet contained all the maps and information (headings to fly, timetable, safe altitudes, important radiofrequencies, minimum fuel) so the preparation and the briefing of the equivalent mission could be considered as routine. For our formation of 4 Mirages, Toto would take the lead. As the majority of the squadron-population consisted of young pilots, with an average flying experience of 600 flying-hours great total, we had not enough pair-leaders (experienced leaders who are authorized to take the lead of two aircraft). Therefore I would fly as number 3 with Tienne as my wingman. Jean would fly as number 2. The preparation of a mission is most of the time rather hectic, particularly when several eyeballs of evaluators are watching you, and all this in an overcrowded planning-room, where everybody cuts maps, calculates headings and determines the best useable weapon with its delivery parameters, while the clock ticks tireless. As far as I can remember, we met all preparation criteria for both the real and the equivalent mission. We were trying to memorize the last minute of our attack mission, the so called final run in from Initial Point or IP to the target. The attack profile itself and the necessity to keep formation cohesion after the attack were reminded several times. The first two aircraft would fire each two salvo’s of seven unguided 2,75 inch rockets after pulling up to an altitude of 1000 meter above the ground level. Tienne and myself would each release two Matra bombs of 400 kilogramme, released at some 60 metres above the ground at a speed of 800 kilometres an hour. We had also communicated by telephone the necessary information for a flight-plan. And in the early days of the Mirage, we still believed in the quality of our navigation-system, that with the input of the Doppler, could be of great help during any navigation at low level, specifically when the flying conditions were deteriorating. So all the "reglettes" for our SSU-boxes were cut with the coordinates of our waypoints and diversion airfields. Half an hour before our planned take off time, we were ready to step with flying gear, gasmask and double infantry helmet and with all our flying documentation stuffed into the pockets of our anti-g suit. The VW-bus dropped us off one by one at our open parking place, hidden into the woods of the extreme northern part of the airfield. The start up and ride to the runway went uneventful. It was like a continuous stream of Mirages, also the ones of the recce counterparts of the 42nd squadron, who waited impatiently to get airborne. Toto obtained soon the clearance to depart, steadfastly followed by the three youngsters of his formation. The blue sky of this beautiful day in early spring was by all of us sensed as an irresistible invitation to hit the afterburner and fly eastbound. In the cockpit of my Mirage, with tail-number BA 03 (preserved at Temploux airfield since 4 April 2006), the sequence of the injection and functioning lights of the afterburner, followed by the oscillation of the revolution-counter of the engine, assured me that I would reach within 1000 metres a speed of 270 kilometres an hour, time to start the gently lift off of the nose with comfortable flying conditions immediately thereafter. Our formation was amongst the first ones to leave the concrete of Florennes, at about 10 o’clock. The complete stream of Mirage fighter bombers and recce birds consisted of about 30 aircraft, who all took off in a very compressed schedule. They would also return all at the same time but the weather forecast stayed optimistic so the recovery of the fleet of Mirages was not causing any concern. Unfortunately, the unpredictability of showery weather these days would cause a lot of trouble some 90 minutes later. But first of all, the events in our Toto formation are maybe worthwhile to be reported. As the flying conditions were ideal, -no clouds and an unlimited visibility-, we were all very confident that our equivalent mission would be flown without any hick-ups. We progressed eastbound in a standard set up. Toto leading the fourship, with myself laterally separated at about 1500 metres and with both wingmen, the numbers 2 (Jean) and 4 (Tienne), respectively positioned to Toto’s left wing and my right wing at 300 metres under an angle of 45 degrees. Our radar-altimeters were set at 150 metres above the ground level and we were travelling at a speed of 750 kilometres an hour. We crossed the Ardennes, passed the German border north of the city of Luxembourg, continued over the rolling hills and wooded area of the Eifel and plunged into the valley of the river Rhine, west of Karlsruhe. Here we encountered a first minor mishap. Indeed, Tienne called out that he was hit by a bird. I joined up to search for eventual damage at his aircraft. Luckily the bird or birds didn’t enter the air-intakes. His engine kept running smoothly and there were no alarming indications displayed on his cockpit-instruments. On the other hand I noticed that his "adhemar", a small horizontal conical movable axis, placed on the left side of the nose to indicate the angle of attack of the aircraft, was almost completely snatched off and was of no further use. Furthermore, the bird had punched a hole, as big as a fist, into the "châssis canon" of his Mirage, situated in the frontal belly of the aircraft. The overall damage to the aircraft would cause no danger for a safe continuation of the flight. Would it have been a real war-mission the probable obstruction of the 30 mm canon would have handicapped Tienne a lot, as the only means of self-defence would have been lost. In the mean time we continued our mission as documented in the CMF. We were supposed to reach the IP, the highway junction of Heilbronn, pretty soon. For a unknown reason Toto passed a few kilometres south of the IP and continued on a easterly heading. After a few minutes the skyline clearly indicated what I expected. Indeed, in my CMF and on the terrain the huge American Army Aviation airfield of Schwabisch Hall was just a few kilometres away, dead ahead. Without hesitation I informed Toto over the radio that we should immediately make a sharp turn of 180 degrees, in order to avoid the control-one of the airfield and to reach our IP without delay. So we all did as suggested. The highway-crossing of Heilbronn was this time easily identified and the German military, busy in their daily work at their NIKE-site, were probably slightly surprised when we roared over our equivalent target. When we had again our act together after the simulated attack, we just faced one important problem. We were supposed to have a comfortable amount of fuel to get home. The reality of life was that we had flown already at low level for more than 50 minutes and consequently we had consumed 700 litres over our planned quantity. Indeed, with our internal fuel of 3000 litres and 3400 litres in the two external fuel-tanks, we would normally easily land with the required minimum fuel of 1200 litres, while flying the whole mission at low altitude. The only initiative to restore some flying comfort inside the four cockpits was to climb immediately at an altitude of 30.000 feet (10 kilometres) where the fuel consumption of our insatiable Mirages was more economic. Toto therefore slammed his throttle forward, pointed his nose upwards into the slightly cloudy sky and a few minutes later we were travelling at a speed of Mach 0,8 (850 kilometres an hour), in a straight line towards Florennes. A quick check revealed that none of us would land with the prescribed minimum fuel. But hoping that the weather during the recovery would be acceptable, we would again gain some time and some fuel if we could descent visually. When we passed abeam the airway chokepoint of Nattenheim, it was about time to contact Belga Radar, the military air traffic centre of Semmerzaeke that assists all military aircraft that fly over the Belgian territory. When we were after a while listening out on Belga we were ill at ease. Firstly there was a lot of radio traffic. This was an indication that a lot of aircraft were returning home at high altitude. Furthermore, we recognized a lot of voices of our squadron colleagues. The assessment of the situation was that in order to set up a safe traffic-stream into our home-base, we would certainly encounter some delay with as a result less fuel in our tanks, who were really drying up. Secondly, we had no radio-contact with Jean. It was clear that he received the radio-calls but could not transmit any message. As he had also the lowest fuel-reserve, we followed the standard procedure. He joined up into my right wing and we both would descent first. Toto and Tienne would follow a few kilometres behind us. As we informed Belga of our precarious fuel situation, we obtained some priority for the descent. With hand-signs I informed Jean of our intentions and configuration-changes. The descent went smoothly and we were braking clouds well east of Dinant. With Jean in my wing in landing configuration, I spotted the lights of runway 26 R (right) just after crossing the river Meuse. In front of these lights I made it clear to Jean that the runway was in front and he could land, by pointing my index forward. With some 800 litres left I decided to overshoot and to land out of a close circuit. At that specific moment my attention was caught by a black apparently dense air-mass that was blocking as a real wall the airspace situated pretty close to the end of the runway. This situation didn’t cause any harm to me. I landed, pulled my drag-chute and entered the taxitrack after a standard braking action. I was of course curious to know where Tienne and Toto were at that moment. On the radio I heard that the latter announced clearly that he would make a low approach for both Mirages while Tienne, flying apparently on the fumes of his fuel-tank, decided to land because he had a non-obstructed runway in front and he felt comfortable enough to do so. Toto performed also a close circuit and landed without hesitation. This apparent disobedience of Tienne was no reason for any supplementary excitement afterwards, taking into consideration the sequence of events during and after our mission. In any case, we were all satisfied that we were all four safely on the ground, and it is true, all with less than 600 litres on the fuel-counter. So we taxied to our parking places. But it would take a hell of a time before we could shut down our engines. Indeed first we had to take cover for an imminent air-attack, announced by the control-tower. We decided to park our aircraft temporarily with running engines in the vicinity of two maintenance hangars. The attackers, 6 aircraft of our squadron, suddenly popped up but disappeared abruptly in the earlier observed dark low clouds, that had reached the boundary of the airfield. From that moment on the paralyzing effect of a huge snow-shower immobilized all activities of an airbase under TACEVAL. Everybody took cover. All aircraft, ready to land, were ordered to land elsewhere. Afterwards we were informed that we were the last complete formation who was lucky to land at Florennes after a flight of 1 hour 30. 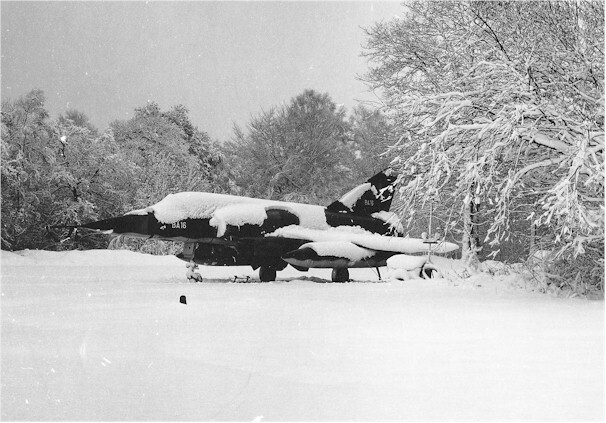 In any way, within minutes Florennes airbase was transformed into a white carpet which made any movement of aircraft a risky undertaking. When finally it stopped snowing, we continued for the last portion of our mission, trying to find back our parking-place in the white landscape. Luckily, the lights along the taxitracks gave us some confidence and valuable information where was the physical limit between the asphalt and the grass. Furthermore, the surface was rather slippery but the mini-stops with their pulsating braking kept us all on the hardened surfaces. This kind of ABS, that we find these days on all our cars, was of great help because without nose-wheel steering, particularly on slippery terrain, driving a Mirage by alternative braking on the two main wheels was not always an easy job. Before to park my BA 03 at the appropriate location, I encountered the last surprise of the day. After crossing the civilian road Florennes-Corenne, just behind the sharp descending turn of the taxitrack, another Mirage who missed his parking, was approaching head on. We managed to cross in the snowed-up environment of "les Aires Nord" just at the entrance of a parking lot with a few centimetres of wingtip clearance. About 2 hours 30 after we left our parking bays, our impatient crew-chiefs were happy to see us back. We were also very delighted that we finally could take cover in our squadron-bunker. Here we noticed a certain tension and specially when the OPS informed us after a while that for the time being all flying activities were suspended, that most of the Belgian airfields were closed due to havy snowfall and that we had no news about nine of our squadron-pilots. This was alarming news and it gave us the feeling that missing nine of our best friends during an exercise, that was simulating war conditions, could only be fiction. But it lasted many many long minutes before this fear finally was transformed into reassuring news. Indeed, one by one, the pilots who landed elsewhere, very often in extremely difficult weather-conditions with almost no fuel left, assured us that they were safe on the ground. Unfortunately, for two of our friends who performed the simulated attack with six aircraft and disappeared all in the snow-shower, the situation was more or less dramatic. Duc as leader and Guy as his wingman, managed to stay together in close formation. When they were in the final stage for a diversion landing at the airfield of Bitburg, situated in Germany at some 100 kilometres south-east of Florennes, Guy ran out of fuel and made use of his Martin Baker ejection seat. 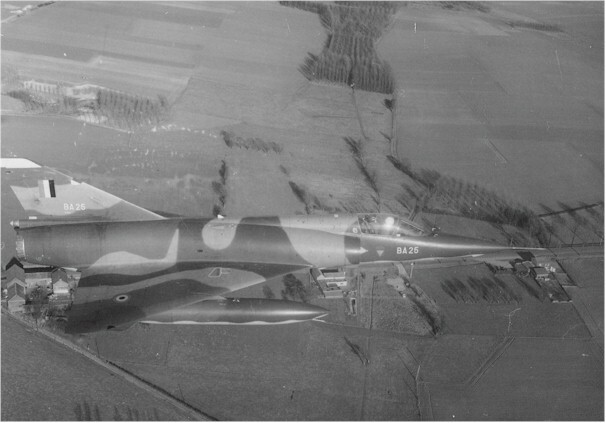 The first Belgian Mirage with tail-number BA 25 would crash in the vicinity of Bitburg in an open field. Guy phoned us after a while from the hospital that he was in good condition and that he suffered only minor injuries at his back. 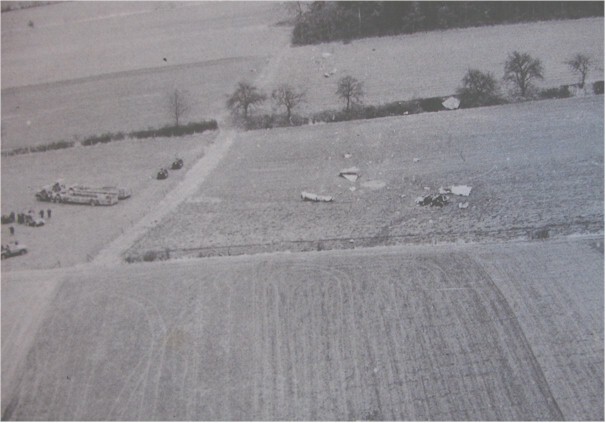 Duc reaches the airfield of Bitburg but a few hundred metres short of the runway also his aircraft, the BA 28, flamed out and the landing without a running engine ended in the grass. The aircraft was only slightly damaged and landed two days later at his homebase. For us all the exercise-portion of TACEVAL was over. The following two days we demonstrated to the TACEVAL-team by dropping exercise-bombs and by firing rockets and our 30 mm canon at the firing range of Pampa, situated at Helchteren, that the 2nd squadron was really operationally ready. 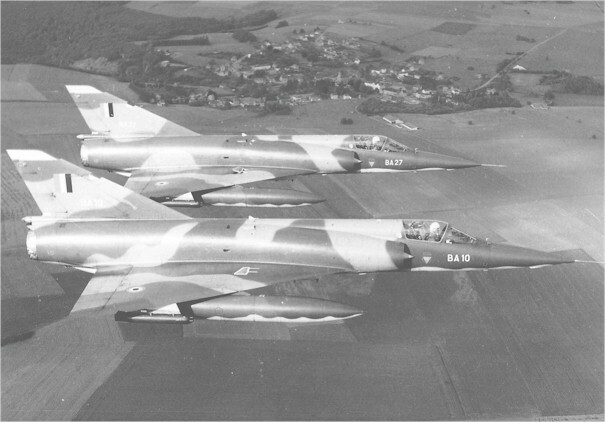 Also the 42nd squadron obtained their first standard operational qualification on their recce version of the Mirage. 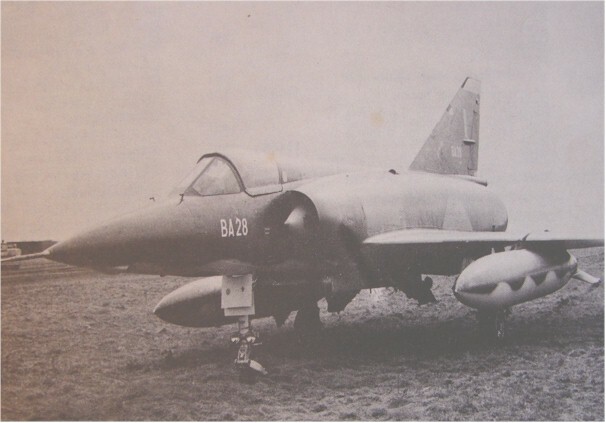 On 29 March 1972 all Belgian newspapers paid a lot of attention to the snow-showers of the day before, with almost catastrophic consequences for the Belgian Air Force who lost that day their first Mirage. The TACEVAL-team gave the 2nd Wing of Florennes in her report the rating the unit and its personnel really deserved. The investigation board of the Belgian Air Force, examining the circumstances and causes of the aircraft crash, had not to so many glorifying words to mention in their report. A lot of anomalies were identified, particularly in the area of weather forecast, diversion capability and procedures for aircraft in distress and supervision of flying. And to conclude, I have really no explanation why the flight of 28 March 1972 stays so lively in my memory. What unmistakable is correct is the observation that all pilots, who flew that day, had a lot of luck. De dag dat de eerste Belgische Mirage crashte. Le jour où le premier Mirage belge s'écrasa.